Deciding on which teaching method works best for your students can be an overwhelming challenge. Deciding on which teaching method works best for your students can be an overwhelming challenge. While it is impossible to cater for every student’s needs and learning styles, it is possible to engage with students and create rich learning experiences. One way of doing this is through project-based learning. You might say, aren’t most learning activities project-based? The answer is yes, most are. 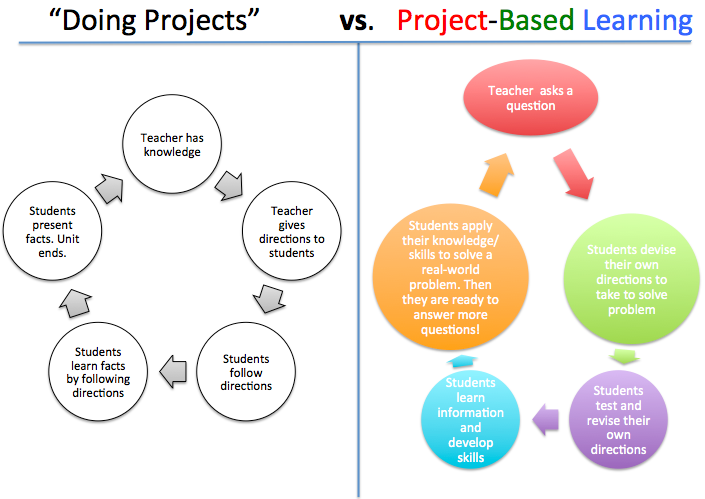 However, there is a difference between ‘doing projects’ versus project-based learning. Good Learning is a Rich Process. No matter what the topic is, we have a tendency to put a strong emphasis on the result. For instance, once we start learning Spanish, our goal is to become fluent in Español. To become fluent, generally speaking, you’ll need to learn Spanish grammar and vocabulary. One way of doing this is through comedy podcasts, catching up with the Spanish community in your town and going for weekend getaways to Malaga, Ibiza, or another wonderful Spanish-speaking place. You would pick up grammar and vocabulary during this process while enjoying every single part of your learning! Or, you can choose to memorise vocabulary and practice grammar daily for couple of years – on your own. Same goal – different learning process. Project-based learning is one of the methods which emphasises active involvement of your students and learning in groups and learning communities. As a result, the process is the core of students’ learning. Students collaborate, enquire, search, analyse, evaluate and create.This method allows them to experience, link the information with real life situations and experiences, and to change the way they think from passive to active and creative thinking. And, more importantly, they learn to incorporate social influences and dynamics into the holistic learning process. Because learning is a highly dynamic process. A highly valued skill nowadays is not what the student knows but how the student can work with what they know. In other words, the ability to process the knowledge and information within a social environment. Students can experience and develop these advanced skills through project-based learning. What are the most significant benefits of project-based learning? Experiencing learning on a deeper level through experience, enquiries, communication, research, linking with real life situations. Communicate well & provide your students with clear instructions. Communicate clearly what the topic is, and what you expect them to do and to achieve. As mentioned earlier, emphasise the process which leads to achieving the goal. At the same time, provide them with plenty of opportunities to be independent, curious and creative. You never know what awesome ideas can result from this! Create groups. You can instruct your students to create groups in the course or you can create it on your own and invite how to join an assigned group. Clarify what the required number of students is per group. You can also suggest for students to choose a “group ambassador” who will take on the role of a group facilitator. Give them tips for tools they can use. Mindmeister, Glogster, VoiceThread, Animoto, Popplet, Audioboom, Powtoon, are just some examples of useful websites. Ask your students to share other useful programs or tools they might have used in the past and would recommend. Provide support during their learning process, ask about their progress, achievements, challenges, and experiences. Taking on a role as a facilitator means being approachable while also giving students enough space to be creative and independent learners. Finally, don’t forget to ask students to reflect on their process and the final results. Acknowledgement and praise for their effort and hard work goes a long way! What is your experience with project-based learning? Share with others in the comments section below!